Hello everyone. Thank you for having us! 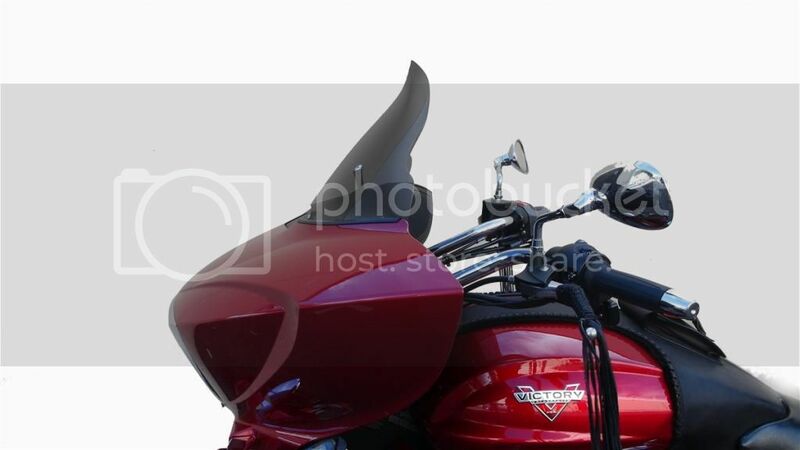 Wanted to introduce you all to our new V-Curve shield for the Victory Cross Country and Cross Country Tour. These things are great. Made from the highest grade FMR Lexan Polycarbonate with a glass hard coating on both sides. This is the same stuff they use to make bullet-proof glass! No joke. These are available in 8-16" sizes so you're sure to get the correct size for you. Designed with our Re-Curve that pushes air up and over the rider heads so you can see over the shield and be protected as if you were looking over it. Check them out on our site. ordered an 8". Holes don't line up very well. Will need to make them bigger so I can screw the stock screws in all the way. Screen works very well, just disappointed they have not addressed the fitment issues. Just got one in. Let's see how it does once it's on. I'll send it to you if your serious. You pay postage and handling. It is an 11 inch I believe.